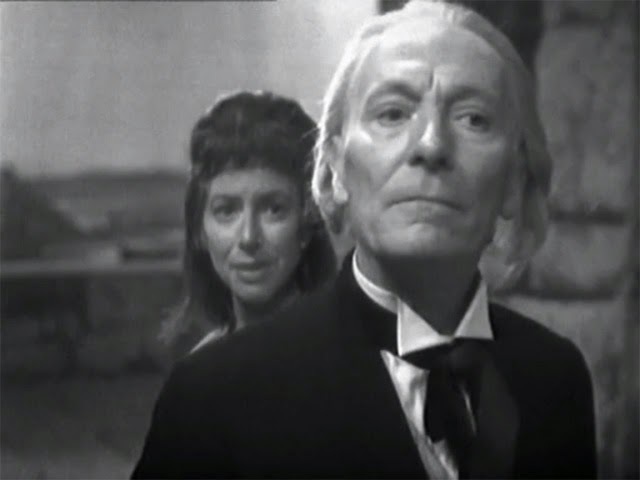 Geek Couples: The First Doctor and Cameca | Warped Factor - Words in the Key of Geek. 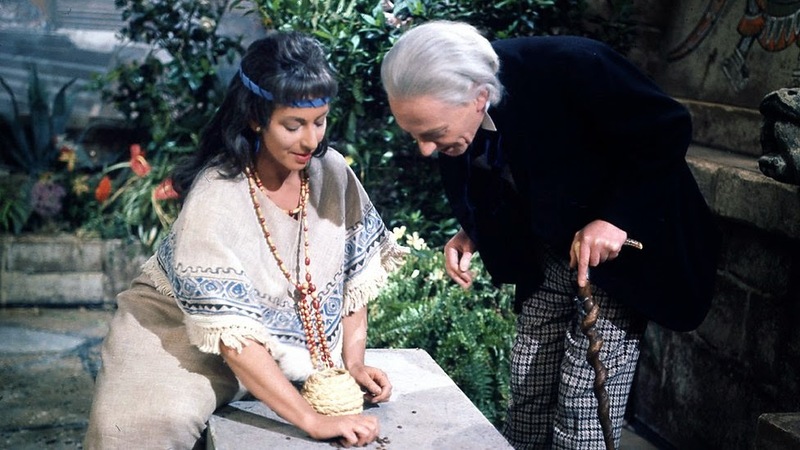 With romance dominating this week, lets allow the First Doctor & his lovely Aztec lady friend Cameca to lead us down Lovers Lane! DOCTOR: And what about her? AUTLOC: Cameca? Of all those here, her advice is most sought after. DOCTOR: What did you say her name was? AUTLOC: Cameca. You will find her a companion of wit and interest. And now I beg permission to depart. DOCTOR: Of course. In spite of the drought, there's plenty of water for the flowers. CAMECA: Better to go hungry than starve for beauty. DOCTOR: Thank you. Mmm, all the perfume of the gods. I find this place delightful. So restful. CAMECA: It is the Garden of Peace. DOCTOR: A very apt description. 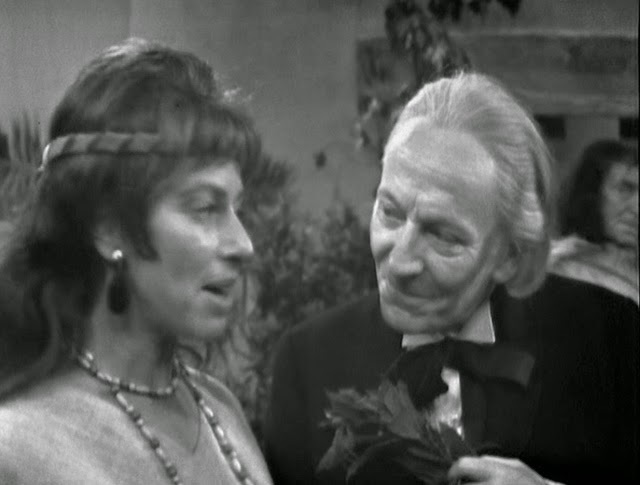 And they must really like each other, for they soon meet again- & the Doctor turns on the charm, the sly devil! DOCTOR: What leaf is this? CAMECA: It's from a herb. The sap is used by our medicine men to induce sleep, but the leaves are harmless. DOCTOR: I think I know about it. CAMECA: You are a healer? DOCTOR: No, no, they call me the Doctor. I am a scientist, an engineer. I'm a builder of things. CAMECA: Now I understand your interest in the temple. DOCTOR: Yes, there are one or two features inside the temple that intrigue me. CAMECA: I have some knowledge of it. DOCTOR: Yes, for instance, the tomb is sealed. Now surely the builder had some way of opening it? CAMECA: My knowledge is too limited to answer you, but the builder's son may know. CAMECA: No one could think that of you. I shall arrange a meeting. DOCTOR: Oh, my dear, how charming of you. CAMECA: When shall it be? DOCTOR: Oh, any time. Today? CAMECA: An interested mind brooks no delay. DOCTOR: Yes, and I'm sure that's true of you, too. CAMECA: It was true. Now I am content to spend the time here like the others. 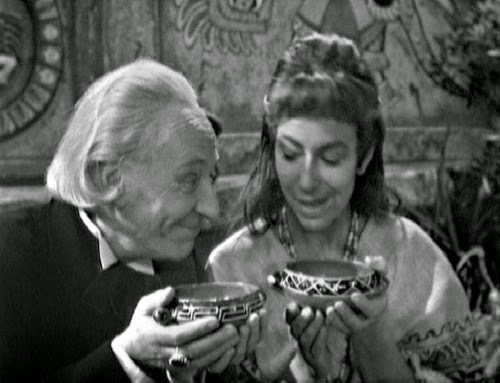 DOCTOR: Oh, but their minds are old, Cameca, and that's something I'm sure yours will never be. CAMECA: Your heart is young too, Doctor. Bit odd for a second date, you'll surely agree. By the third he's engaged, having shared some hot chocolate with her! CAMECA: He is a gentle companion, and most dear to me. AUTLOC: Then prepare these beans as a love potion. CAMECA: That would be too bold. Rather he should show his love for me. AUTLOC: You wish him to prepare it? CAMECA: I greet the good and noble Doctor. DOCTOR: Ah, my dear Cameca. How nice to see you again. The garden's been a lonely place without you. CAMECA: If one's interest is held, loneliness does not exist. DOCTOR: I was merely passing the time until you arrived. Oh, this sign. I hadn't noticed it before. CAMECA: It is the Yetaxa sign. In almost every building, honour is paid to Yetaxa. DOCTOR: Oh, really? Oh, my dear. Cocoa beans? CAMECA: We use these to barter for our daily needs. DOCTOR: What am excellent idea. A currency you can drink. Delicious. CAMECA: You know our custom? DOCTOR: Yes, my dear, of course. CAMECA: The drinking of cocoa has it's own special meaning. DOCTOR: Yes, I agree. A rare delight. We should take a cup together. DOCTOR: Yes, yes, quite. Now, give me some beans and I'll prepare them. CAMECA: You insist upon this? DOCTOR: I do. I insist absolutely. As a token of my esteem. CAMECA: The gods are smiling favour through your eyes. May it always be so. My dear Doctor, I accept with all my heart. But sadly its not the case that everyone's a winner, as the Doctor of course eventually leaves her to return to the TARDIS with Susan, Barbara & Ian. He does, though, keep the brooch she gives him. Not as callous as he might appear in jilting her, then? "I'd hoped I might stay by your side. Then think of me. Think of me.…"